"I have that disease where I think every song has to be a hit. If it's mediocre, I won't do it. "\n-Josh Ward\nFor most independent music artists, a bold statement like this could easily be waved off as a "head in the clouds" sentiment from a young and naive dreamer, but from Houston native Josh Ward, it just so happens to be a bona fide fact. 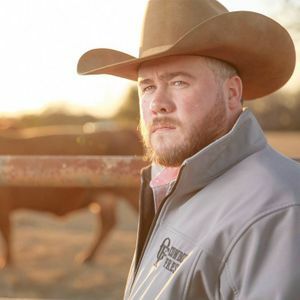 Since the release of both his second studio album "Promises" and his latest studio album "Holding Me Together," Josh has amassed seven consecutive #1hits on the Texas Regional Radio Chart over two solid years and counting, distinguishing him as a new generation heavy weight champion of old school country music. Through tenacity and hard work Josh has grown into one of the most respected and appreciated musicians in the state. A well versed songsmith with a hauntingly traditional voice, his honest and visceral delivery of every song compels audiences to feel his lyrics with him as he takes them on his musical journey. Fellow songwriter Mike Ethan Messick once said of Josh, "Josh Ward sings like Mike Tyson hits hard. "\nJosh Ward found his voice singing old gospel hymns in church when he was knee high to a grasshopper. In high school, while riding in the rodeo circuit, he discovered Willie, Waylon, Merle, Jones and Strait, and found himself feeling like a string of chords being perfectly strummed by those legendary sounds. That feeling inspired him to pick up a guitar and start singing in the parking lots of rodeo events. The reactions and encouragements he spurred from peers and onlookers led him to form his first band and hit the local honky tonk circuit in 2003. Needing something to sell to the demands of a swelling fan base, he recorded his first EP "Hard Whiskey," the title track being to this day one of his most requested at live shows. It was in 2012 when Ward truly found his stride with the release of his first full length album "Promises," produced by GRAMMY Award-winning producer, Greg Hunt. It seemed clear that radio had discovered their new banner artist in Ward with all five singles hitting the Top 20 on the Texas Music charts, three of those scoring #1's\n-almost unheard of for a debut artist. Ward wrapped up 2013 as the Texas Regional Radio's New Male Vocalist of the Year.\nWhen it came time to get back in the studio for his next album, Ward knew just where he was going…back to Rosewood Studios in Tyler, TX with the return of Greg Hunt behind the sound board. Ward credits the hidden jewel studio as the place where he found\nhis sound, and Hunt as the wizard who pulled it out of him. Their work on Ward's third full length album "Holding Me Together" (released October 2015) proved yet another triumphant collaboration. All four singles went to #1 on the TRRR Chart starting with "Highway," the 12-cylinder engine that takes you steadily through the steep grade and back down to TRRR's Song of the Year, "Whiskey & Whitley," with its bottomless tear-jerking come-on's. Through many more miles of winding peaks and valleys on hits like "Somewhere Between Right & Wrong," "Broken Heart," and the new single "Change My Mind," what this album gives you is the white-knuckle roller coaster ride Ward intended you to have. A thrill that translates meticulously to the stage with live performances that not only mirror the studio versions, but as a whole, has only one singular motive…to hold you hostage on the dance floor.\nThe Josh Ward band is Josh Ward (lead vocals, rhythm, guitar), Steve Cargill (bass),\nTravis Bishop (keys, organ, harmony vocals), Justin Cognito (drums), Opie Rigdon (lead guitar) and Glen Shankle (steel guitar).